Steve Jobs, holding the latest Apple TV, a streaming video device similar to the Roku player, announced its release yesterday, another streaming video services device. Like the Roku box, the $99 Apple TV connects to TV’s or computer displays to view movies, television shows, and other videos. Amazon immediately lowered its streaming TV show price to 99 cents. MobiTV, which streams video to 10 million mobile handsets, recently revealed that viewers watch longer as screen size increases. 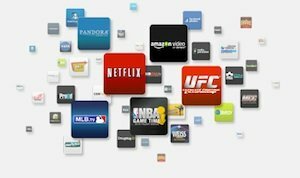 The Apple, Amazon and MobiTV announcements demonstrate the popularity of streaming video over the Internet for home and mobile entertainment. Last March, I wrote a piece on mobility, portability and accessibility and, in September, an article on the Roku Video Player. Both posts deal with “mobile” and multimedia content in a wireless, Internet age. In the first piece, I pointed out that a fridge, for example, is mobile but not very portable. A hair dryer is portable and mobile but only if you’re within three feet of a wall socket. And a semi-truck is both mobile and portable but not in a consumer electronics sense. The biggest challenge to consumer electronic companies, whether smartphone, personal computer, video player or iPad manufacturers, is accessibility of content, the same issue driving cloud computing. A Roku or Apple TV box is small and portable. So as long as users have access to the Internet and a video display, content is accessible. To a great extent, accessibility is the main factor increasing smartphone and other wireless device sales. Both an Android phone and an iPad are mobile, portable and accessible regardless of location. However, the user experience when watching an HD movie on a 42-inch high definition television is considerably different than streaming the same content on an HTC EVO, just as going to a movie theater offers an entertainment experience unduplicated in the home. Regardless of device or location, though, it’s undeniable that whoever controls the distribution of multimedia via the Web will control the market. That’s why Comcast, Hulu, Netflix and other companies are partnering with movie studios for exclusive distribution of video. It’s also why the satellite companies–Directv and Dish TV, in particular–are running scared. What concerns me the most, however, are large enterprises that control both multimedia distribution and the content. Comcast and Time Warner Cable are the most worrisome as streaming video and audio wars rage across the Internet.